Samsung has today officially launched the Galaxy Note 7, the latest in its line of stylus-equipped flagship smartphones. It turns out all of the leaks and rumors were basically true. The Note 7, which is not called the Note 6, blends many of the features from last year’s Note 5 with the design and waterproofing of this year’s excellent S7 Edge. The Note 7 will be available from all four major carriers on August 19th, with preorders starting tomorrow, August 3rd. Samsung says that pricing will be commensurate with prior Note devices and will be higher than the S7 Edge, which is about $770 to $800, depending on where you look. An unlocked version of the Note 7 will be available in the US at a later date. For years Samsung has differentiated the power-user focused Note line from its more mainstream handsets by juicing up the specs inside of it. This year’s approach is a little different, however: inside, the Note 7 is virtually indistinguishable from the S7 or S7 Edge. It has the same Qualcomm Snapdragon 820 processor (in North America, China, and Japan; other markets will have Samsung’s own Exynos processor), same 4GB of RAM, same quick charging and quick wireless charging, and same 12-megapixel camera with f/1.7 lens and optical stabilization as the S7 series. The Note 7 is similarly water resistant (rated to IP68 specifications) and has support for microSD cards, both of which were not present in last year’s Note 5. The Note 7 has 64GB of internal storage, compared to the S7’s 32GB, and its battery has been increased to 3,500mAh over the Note 5’s 3,000mAh cell. The NOTE 7'S Specs are largely the same as the S7 series. 'Coral Blue' Galaxy Note 7 is coming to the US on August 19, UK on September 2. Samsung's Note 7 comes with a gift: A Gear Fit 2 or 256GB SD card. MicroSD card slot (like the S7 phones). Water-resistant phone body and S Pen. If you can't wait to nab one for yourself, be aware that the Note 7 is quite costly, and is one of the more expensive Samsung phones next to the Edge series. In the US, pre-orders for the Coral Blue, Black Onyx, Silver Titanium colors (no Gold in the US) begin August 3 and a few carriers have already announced pricing as well as bundled promotions including the new Samsung Gear VR headset or a 256GB memory card. No official pricing has been released for the UK yet, but Vodafone, O2, GiffGaff, Three and EE all confirmed that they will carry the Note 7. In the UK, online retailer Mobilefun is quoting a price of £749, but Samsung and other networks have yet to release their own pricing. Vodafone, O2, GiffGaff, Three and EE, however, all confirmed that they will carry the Note 7. Australian pricing will see the phone sell for AU$1,349 from Telstra, Optus, Vodafone, Virgin Mobile, JB Hi Fi, Harvey Norman, Samsung Retail. 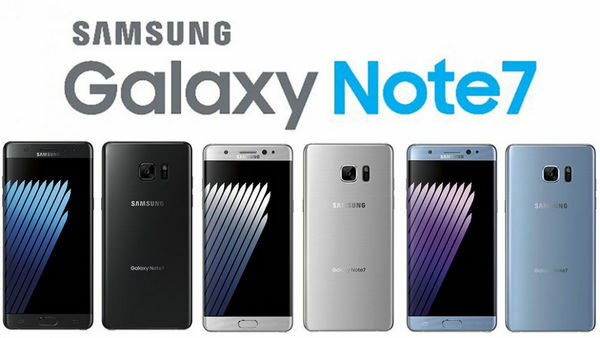 If you got your new Samsung Galaxy Note 7 and would like to transfer files from old phone to new Samsung Galaxy Note 7, the Phone to Phone Transfer tool would be your best choice to transfer music, contact, messages, photos and more files from old phone to new Samsung Galaxy Note 7.